When not in skibiking mode I like to get in plenty of good old fashioned cycling, usually this takes the place of many miles of urban riding just trying to get to work and back in one piece. 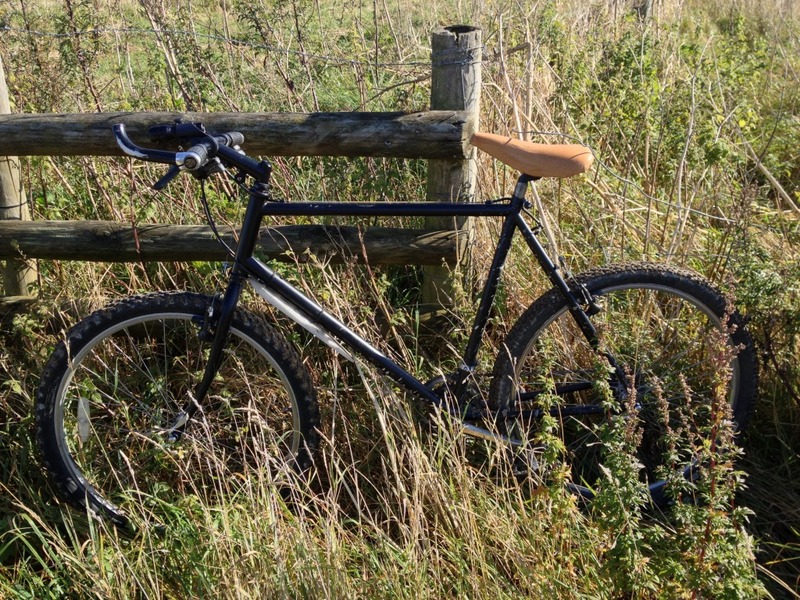 But as an incorrigible escapist I am always on the hunt for bike adventure, no matter how small. When I spotted that one of the gents on the excellent RetroBike forum was planning a special birthday celebration ride from Brighton to Eastbourne along the South Downs Way, I committed to joining up immediately. 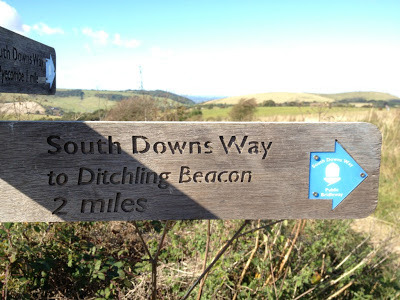 For those who don't know, the 160 kilometre long South Downs Way follows the old routes and droveways along the chalk escarpment and ridges of the English South Downs. The route provides the visitor with the opportunity "to get away from it all" without having to travel too far in this busy part of England. The undulating route not only provides a wonderful trip for long distance riders but also provides interesting day trips and short breaks. In the last decade I have covered many miles on road, canal tow paths and gravel trails, but apart from a few days in Gran Canaria in 2000 my experience of off-road riding is limited. 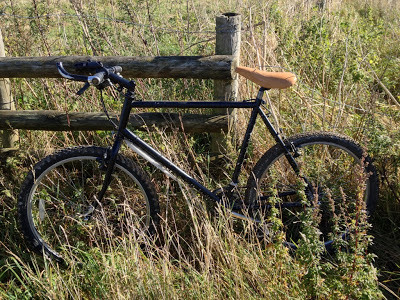 Furthermore, my steed for the journey, was not to be a modern "all mountain" bike, but a traditional, rigid framed, 1991 Marin Muirwoods. A strong, heavy and hopefully dependable machine that I had assembled over the last couple of years for just this type of recreational riding. I had my doubts about whether I would be up to the physical challenge. I knew from the recent months, that I can manage 40 miles a day, for weeks on end if necessary. But also appreciated, that there is a big difference between flat cycle commuting and proper grown up trail riding. Rather than loose any sleep over this dilemma, I chose to take a fatalistic attitude, I would find out on the day. 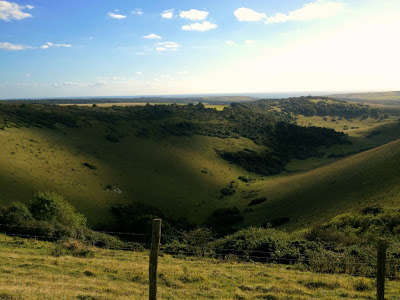 On the morning of the ride I heaved my bike into the boot of "Uncle Fester" the tired old Ford Fiesta and headed due South to the Devil's Dyke, located on the hills overlooking the South Coast above Brighton and Hove. I arrived first, assembled my bike in glorious early morning sunlight and waited for my fellow RetroBikers to arrive. Before long we were off and I was able to get my first taste of riding on chalk. I thought that chalk being porous would provide a stable, dry surface all year round, I couldn't have been more wrong, in many places it was as slippery as ice. Apparently, it gets worse in the winter, the porous chalk oozes excess moisture which freezes overnight. I realised there's more to this mountain biking than I had given it credit for,skibiking is easy by comparison, skis are designed to drift on slippery surfaces, tyres aren't. I found myself plunged into hedges more than once. 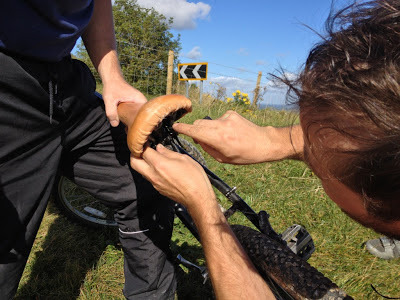 A few miles further on at Ditchling on a particularly bumpy section there was a loud crack, fortunately it wasn't my spine, but the saddle bolt had sheared off. I would have been ready to give up at this point and walk back, but some first class jury rigging by my companions saw the saddle rails tied to the top tube. They suggested we ride on with a detour to the small town of Lewes, where I would find a bike shop and maybe a spare bolt. I rode the following 4 miles solely on the pegs BMX style, necessity is the mother of invention and fortunately, not as tiring as I was expecting. At Lewes we located Lewes Cycleshack, tucked away inside a branch of the sports shop InterEurope. A few words with the workshop staff and a quick scrap bin rummage sourced a replacement bolt and top clamp piece. The resulting combo cobbled together was not totally secure, but at least something I could put my bodyweight on and not risk accidental impalement. We still had two thirds of the route left to go and the real pain was about to begin, impossibly it seemed to be uphill all the way. I soon began to appreciate what a "technical climb" meant; trying to ride in granny gear up steep, narrow, brick and rock strewn lanes was horrid, in many places it was quicker to get off and walk. Irritatingly the oldest member and quickest ascending member of the group was riding single speed! 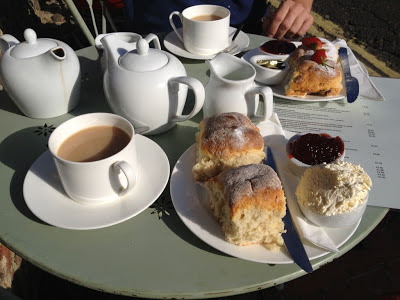 After a refreshment break for tea and scones at Alfriston village it was time for the final punishing climb, after which it was level all the way to the outskirts of Eastbourne. The ride down from Beachy Head was the thrill of the day, with my weight as far back as possible, lots of back brake, rear tyre locking up and skidding about, vision blurred and still gaining speed. True men ride the same route back to Brighton, some do the whole South Downs Way in a single day, there are even god like creatures reported to have done the entire route both ways in a single hit. But for us the journey was done and the train would take us back to Brighton. Back in Brighton I said good bye to the boys thinking the ride was over, how wrong could I be, I had another 5 miles to go to get back to the car and uphill too. On wobbly legs I made the ride up to the A27 trunk road followed by a periloius ride along it to find the route back up to the car park on the Devil's Dyke. It was actually a lovely, quiet ride under a full moon for the last couple of miles, did you know that cows still eat during the night? I plonked the Marin in the boot of the car and made the quick 45 minute drive home, it was time for a well deserved beer. Some do the whole South Downs Way in a single day! "Autumn clean", no it just doesn't have the same ring to it as "Spring clean", but that's what I've been up to for the past few days. I have started to transfer almost all of the information stored at SkiBiker.org over to this blog to be archived as static web pages. I thought that this would be a few hours work, but as ever, it took much longer than expected as I realised some of the information could really do with updating and reformatting too. Below the new and prettier header section, you will find links that should help answer 99% of the questions any skibiker newbie might ask, such as; "FAQs", "Where to SkiBike? ", "How to SkiBike", "(How to) Build a SkiBike" or (Where to) "Buy a SkiBike". There is now a contact page, with a proper mail form, any questions still left unanswered can be mailed to me, whilst avoiding having my email address available to the spammers. I have also updated the lists of skibike manufacturers and skibike conversion kit suppliers, there should be a few new names yet to be added over the following weeks too. I spent quite a while pouring over the list of skibike friendly resorts and have now given the countries with a lot of potential skibiking holiday destinations, such as; Austria and France their own individual pages. The list is very European centric currently, but I have pages for Canada and the USA waiting in the wings, which will need populating with information. I will harvest some information from the net, but there is nothing like a verified account from a local skibiker. I know that a fair share of the readership of this blog are from the USA and Canada, so please send the names of your local skibike friendly haunts for inclusion. I have created a page for real world skibike clubs, there are only 3 national clubs that I know of, which cover, France, Great Britain and the USA. There is also a page listing skibike social networking sites, such as Facebook and discussion forums. Lastly, as so many of the readership do not have English as their mother tongue, I have included a translation widget for their use.